I know what you are thinking…another wing recipe? What can I say? I love wings. 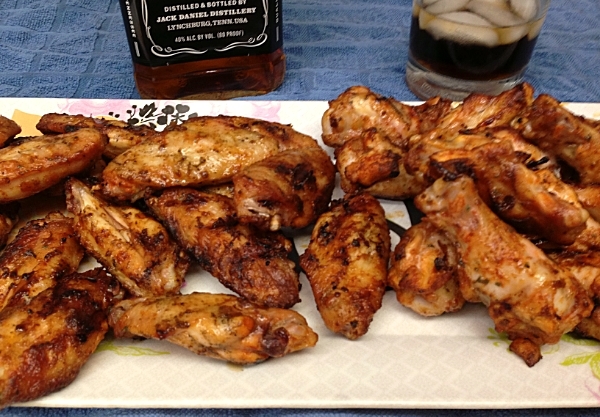 And since my birthday was this past weekend, I decided I wanted to cook some wings. I was trying to come up with a new recipe and I remembered some spicy ranch wings that I got at a wing place called Pluckers. They were ok, but I figured I could find a better recipe that incorporated that ranch flavor into the wings. These came out nothing like Pluckers, BTW. 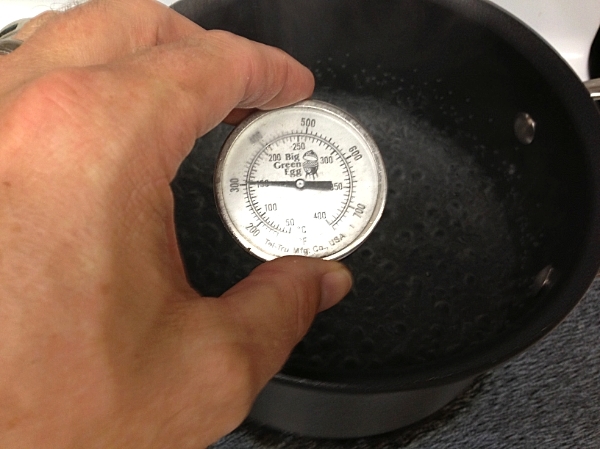 Calibrating my thermometer in boiling water. Before I got started, I decided to calibrate the dome thermometer on my BGE. Lately, some of my cooks have been taking longer than usual. I started boiling some water and placed the thermometer in the pot. In the above picture, the water wasn’t even boiling and it was already reading over 300F. For those who don’t remember their science classes, water boils at 212F at sea level. My thermometer was reading about a 100 degrees too hot, that could explain quite a bit! If you are running a Tel-Tru thermometer (and possible some other ones), you will find a nut on the back of the thermometer. Using a wrench to turn that nut, you can adjust the needle so it reads 212F when placed in boiling water. Always a good idea to check your thermometers a couple of times a year. 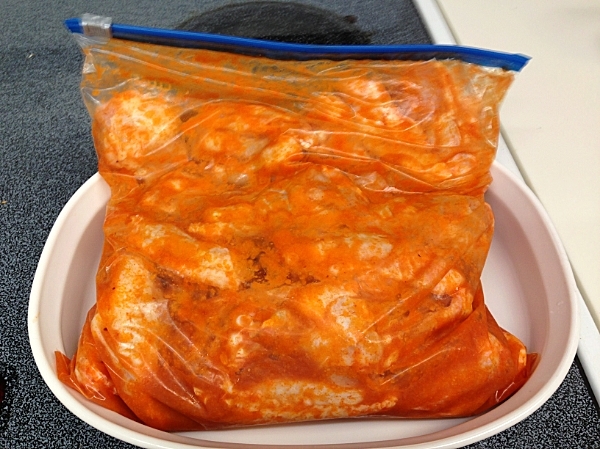 Wings in a Zip-LOck bag with the marinade. In a gallon-size resealable plastic bag, combine hot pepper sauce, melted butter and vinegar. Add chicken wings, seal bag and toss to coat evenly. Set up your grill for an indirect cook at 400F. If using a BGE, set it up for a direct raised grate cook. 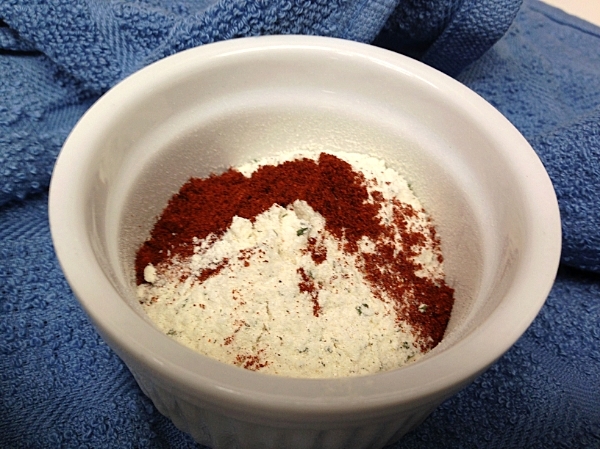 Mix together the ranch dressing powder and paprika. Remove wigs from marinade and sprinkle liberally with dressing mix and paprika. 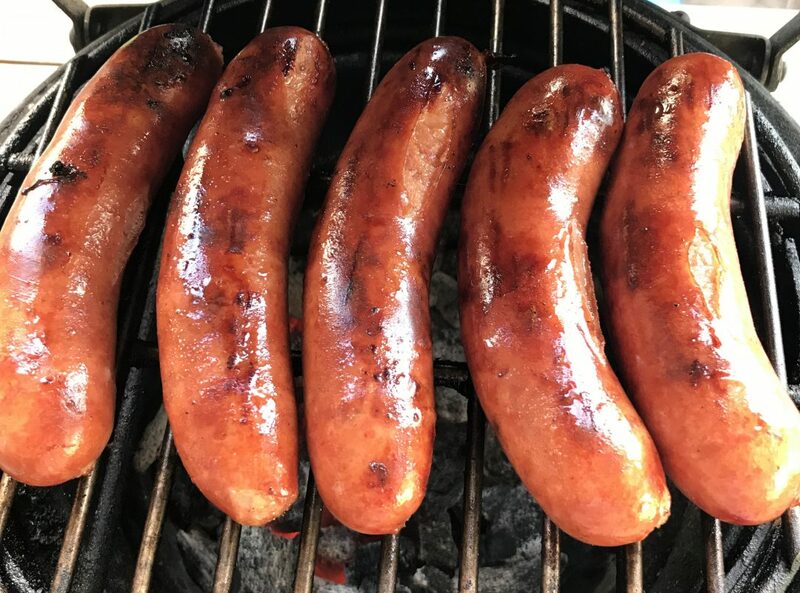 Grill for 35-40 minutes. 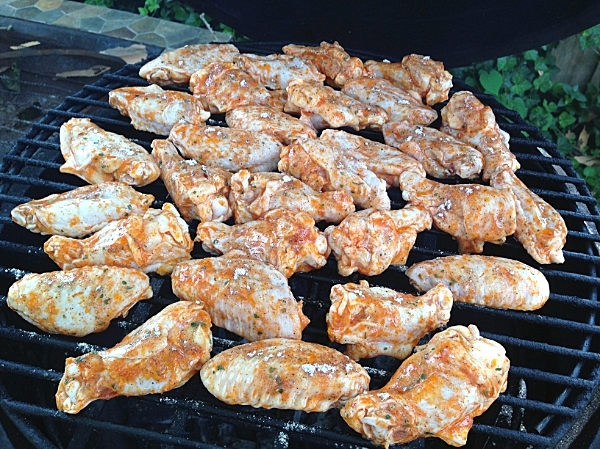 Wings can be cooked higher than chicken breasts and I usually take them to 175-180. More of the fat renders out and they become crispier than if you pull at 165. 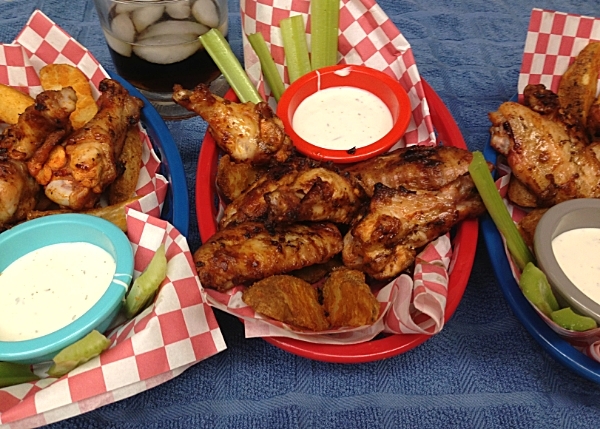 The wings should take 35-40 minutes to cook, but keep an eye on them. You may want to flip and rotate them if you have hot spots on your grill to prevent them from burning and to ensure they cook evenly. If desired, add some wood chips to give them a hint of smoke flavor. 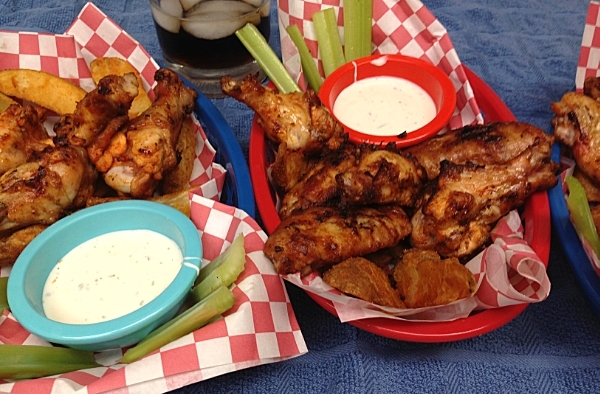 We really like a touch of mesquite with our wings. The wings are done and separated into flats and drums. Is there a picky eater in your house that prefers one over the other? In our house, Mrs. G likes the drummettes and I prefer the flats, so it works out perfectly. Plated up (or should I say basketed up?) with some steak fries, celery and ranch dressing. This was a first for us. Although the marinade is pretty close to a classic Buffalo Wing Sauce, I’ve never marinated them in it before. Usually I just toss it on at once the wings are done. Not sure that it really added any extra flavor. I did get a nice twang from the ranch dressing powder that was sprinkled on before grilling. I really liked that added flavor to the wings and can see doing it again. Didn’t catch much, if any, flavor from the paprika, however. Nor was there much heat. For a “spicy” recipe, this one fell short of the mark. Overall, I’d say it was a very good recipe, the name was just misleading. Buffalo Ranch Chicken Wings would have been more accurate. Maybe I’ll throw in a bit of chipotle powder into the rub next time just to give it some heat and really make them Spicy Ranch Wings. I really think it helped out quite a bit. It gave it more of a complex flavor, more depth and increased the heat, but not so much that your mouth was burning. I’d say it came out just right and people were asking me for the recipe all day so that says something. I have never calibrated the thermometer in my smoker. How embarrassing. I’ll be fixing that immediately, thanks to you! And, I’ll be making these wings. We love them. Buffalo’s is one of my favorite restaurants simply because of their wings, well, and extremely cold beer. Even if these didn’t taste like Pluckers, they sound (and look) delicious. Oh, and just for the record, I’m a flats fan. “Oh, and just for the record, I’m a flats fan.” Just one more reason to like you. 🙂 Cold beer and wings…you just can’t beat it. The wings look outstanding. I’ve incorporated Italian dressing (mix) into my sauce, but never ranch. I will try that. — Have you considered making a buttermilk ranch dressing (from a mix) and marinating the yard bird in it overnight? The enzymes in the buttermilk will not only help to tenderize the muscle, but will also help impart more of that ranch flavor you’re looking for. I know most of us don’t marinate wings overnight, but why not? — Also, paprika lends very little flavor on its own. When you combine it with the loud flavors such as you’ve included here, it’ll only affect the color. Happy belated birthday, by the way. Thanks, Adam. I had not considered the buttermilk ranch marinade, but I don’t see why not. We often soak our chicken in buttermilk prior to frying it, so why not? I’ll have to give it a try. Well done Griff. I’m with you, I could eat chicken wings at every meal if they were there. Hard to get tired of something so good. The baskets I thought were a nice touch! I need to pick up some of those for presentation value. Thank you, kind Sir. World Market should have them relatively cheap. If not, there’s always Amazon. Look mighty tasty! I’ll have to try these. I wonder if rubbing them first with the buttermilk/paprika mix and then hotting them at the end of the cook with the sauce would change things up? I’m totally making these and sharing with a good friend and co-worker who loves heat as much as I do!! Yeah, we save the flats for Trevor since that is his favorite. Funny, I thought we were the only ones that divided them like that. Hey Victor. I use the Adjustable Rig. Highly recommend it. Give Tom a call and he will walk you through it if you are confused/overwhelmed by all the choices. He’ll talk to you and sell you what will fit your needs and not upsale you on anything. Really great guy. Tell him I sent you. In the meantime, you can make a raised grate in many ways. Three opened and empty soda/beer cans placed on the fire ring will work. Or a few fireplace bricks. Cheap, but might not be the most stable option.